What is a Green Man ? Apparently it is not so easy to give a definition. 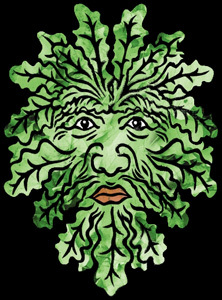 On the internet there are many visions of what a Green Man is or is supposed to be. 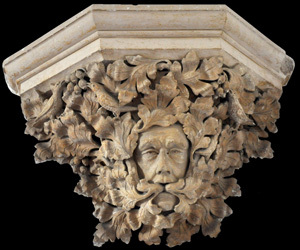 Since the 1970's or a little later, the interest of people was aroused in the subject and the opinion of what a Green Man is varies from "any head, human or animal alike, engulfed in leaves" to "heads out of which branches with leaves appear, no matter from what part of the head". 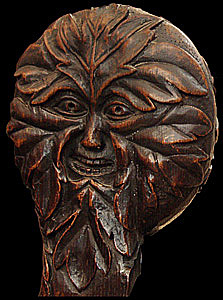 Other interesting questions are : What is the origin of the Green Man ? 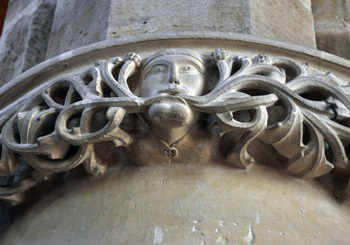 What is the meaning of a Green Man ? 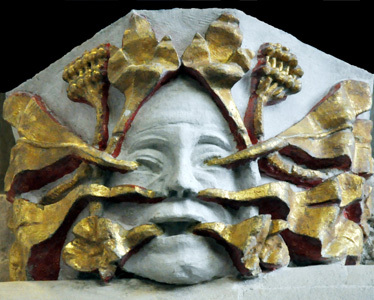 That the Green Man did have a specific meaning in the church may be clear further in this article. The origin, the meaning and its purpose is regretfully unknown as there is no documentation. It is a bit like it is with the labyrinth, guesses, myths. All we know is that the phenomenon of heads from which leaves originate, is very, very old and existed long before the Christian Era. 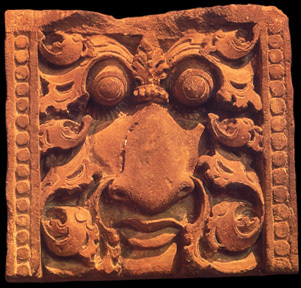 These heads are known to appear in India and Nepal before temples, also in Indonesia. 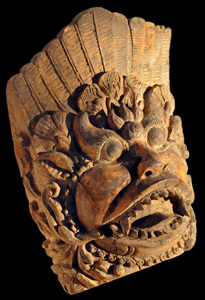 The heads were supposed to keep evil away and therefore they were not only used in and outside temples and churches but also outside common homes. At both corners of the mouth originates a branche with leaves. 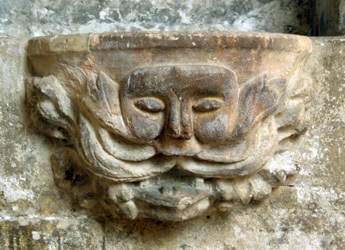 The name "Green Man" was re-introduced in 1939 by Lady Raglan in an article in The Folklore Journal titled "The Green Man in Church Architecture". At the time Lady Raglan was very interested in various features of folklore and their origin. 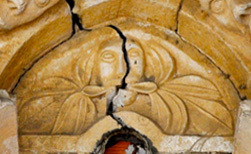 Eight years earlier the vicar of the church in Llangwm called on her and asked her if she knew what the sculpture on a corbel in the church meant. 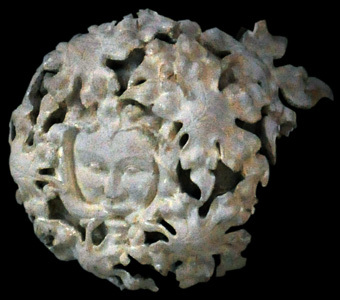 When Lady Raglan saw the sculpture, she said that it was a Green Man. How did she know this name ? 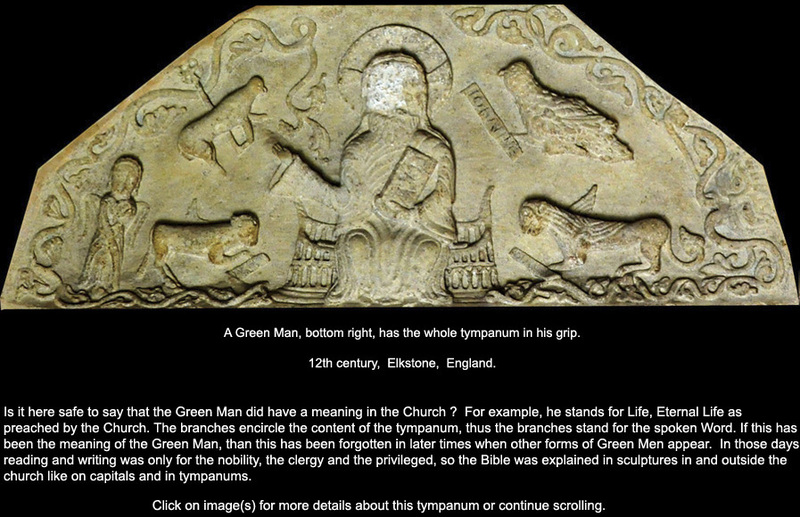 There exists documentation that the name "Green Man" has been used several ages earlier. 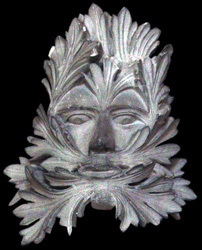 The head that Lady Raglan called a Green Man. 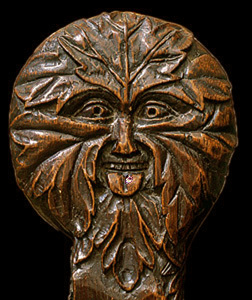 The Green Man in the church should not be confused with the folklore character Jack-in-the-Green, though sometimes one is tempted to do so. Lady Raglan connected Jack-in-the-Green to the May festival, a festival that is popular at times but a festival that did not exist in the 14th century as was shown by Roy Judge in 1975 in his work "The Jack in the Green, a May Day Custom". The earliest Jack in the Green procession dates from 1795. 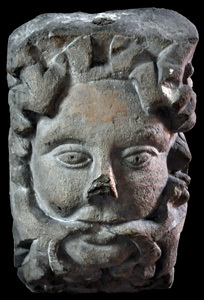 The term Green Man, re-introduced by Lady Raglan, refers to the sculpture found in the church of Llangwm (Wales, United Kingdom) and in her article also the head on the font of Stow Minster is mentioned of which it can be safely said that it is not related to a May Day Custom. 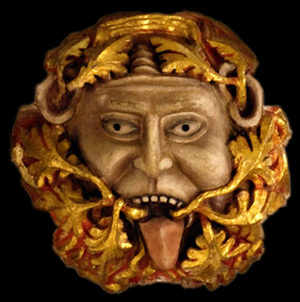 The Green Man has leaves that originate from the mouth and later also from other parts of the head. 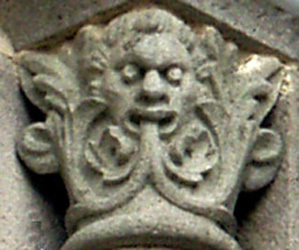 The same is true for the Green Man of Melrose she mentioned. 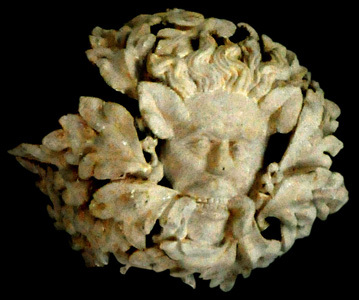 The Green Man enormously gained in interest and soon any head or person engulfed in leaves is unjustly called a Green Man. 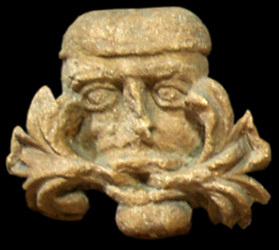 Example : a statuette of a Roman victor with a laurel, that is not a Green Men. Also the roof boss below is not a Green Man as it is Christ with a nimbus with cross. 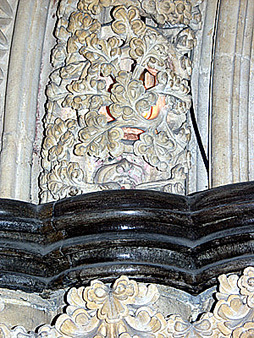 Leaves or vegetation is a very important symbol in the church and can be seen in the sculpture of churches of all ages as well as in windows. Leaves are a symbol of life, eternal life if you wish. 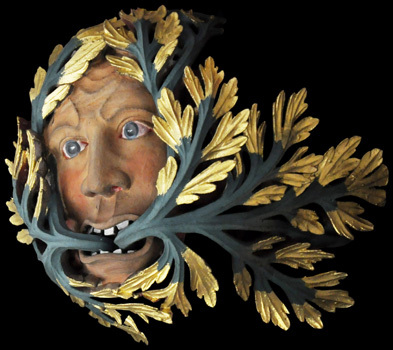 In the older heads the leaves or branches with new leaves originate in the mouth. Two, one at either side. Thus the leaves tell us an important story. 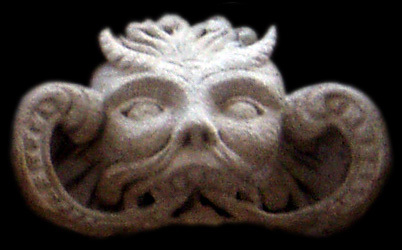 A head with leaves thus described, is nowadays called a Green Man. 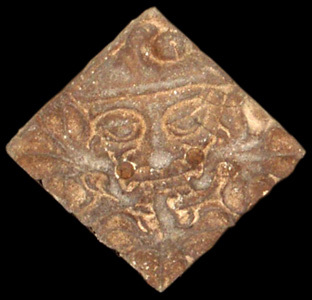 Below there are shown several Green Men and how their appearance changed with time. 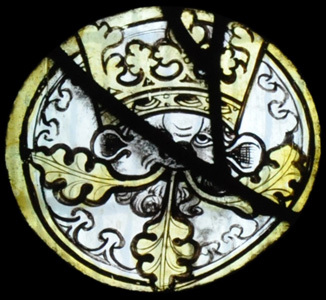 In some cases three branches with leaves originate from a mouth as in the church of Burgh-le-Marsh in England (further down on this page). 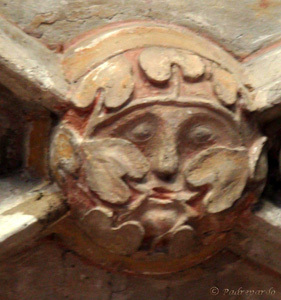 When looking for a Green Man in churches, you find heads where the leaves originate from all possible places on the head, for instance the nose or the cheek or the forehead or even the eyes. Why ? The answer is unknown because there is no documentation whatsoever on the how and why of this phenomenon. A lot has been written, mostly guess work and nothing has been proved. The explanation that the leaves are a symbol of life makes sense in Christian life and in other religions or beliefs. 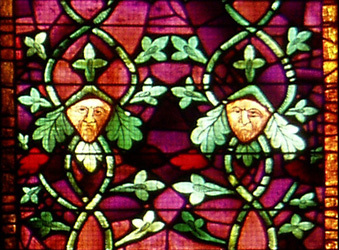 The figures in the window of Léon Cathedral - see picture above - are not to be considered as Green Men. If you look carefuly, you see they are bishops with mitres on their heads. Mitres with a cross. There are many, many of these bishops in a lancet window. The leaves ? Well, that makes sense according to the explanation above or they are there as decoration. Decoration ? 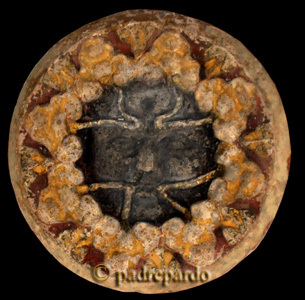 Could that be the reason of the existence of foliated heads at the beginning of this page ? Did the real meaning get lost through the ages as there is no documentation ? In 1563 the Council of Trent ended after many years of deliberation. It was a council of the Roman Catholic Church and the ideology of Faith deepened and rules for behaviour were laid down. Under these new rules the artistic freedom in art was thus severely restricted, for example, the making of Green Men was discouraged. Henceforth the making of Green Men came, more or less, to a halt. In the United Kingdom however, there was no such discouragement because of the separation from the Roman Catholic Church when Henry VIII pronounced himself head of the Church of England. Nowhere else in the world the Green Man flourished so abundantly. 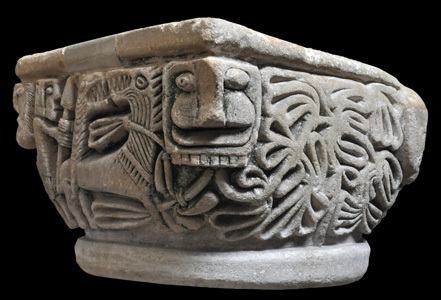 You can safely say that originally heads were to deter evil and these heads were animal heads, inside and also outside churches. Was this a continuation of pagan rites ? 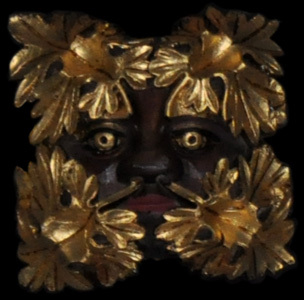 A head to deter evil. Heads to beware us from evil. 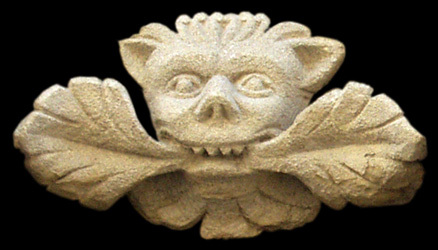 Devilish head and animal head to keep evil away and at the same time giving us hope of a new life. This is shown by the new leaves coming from their mouths. Head on the sarcophagus of Sainte Abre, Poitiers, France. 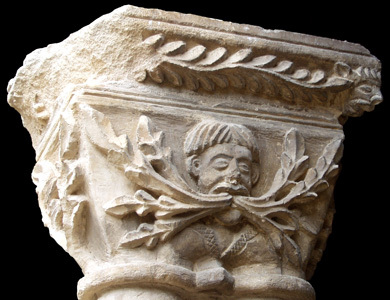 The sarcophagus of Sainte Abre, daughter of St Hilaire, can be found in the romanesque church St Hilaire in Poitiers, France. St. Hilaire was bishop of Poitiers from 352 to 368. 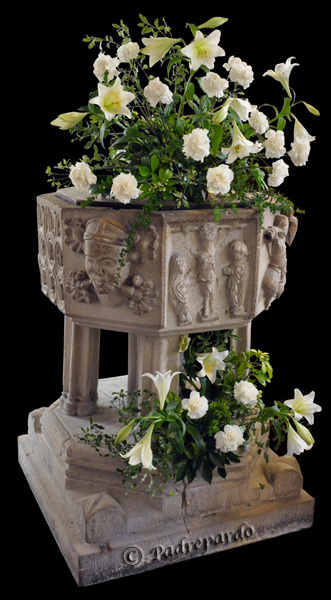 The church was built over the sarcophagus of St Hilaire, and was an important centre of pilgrimage. However, the church suffered several destructions, that is in 732 by the arabs and in 863 by the vikings. 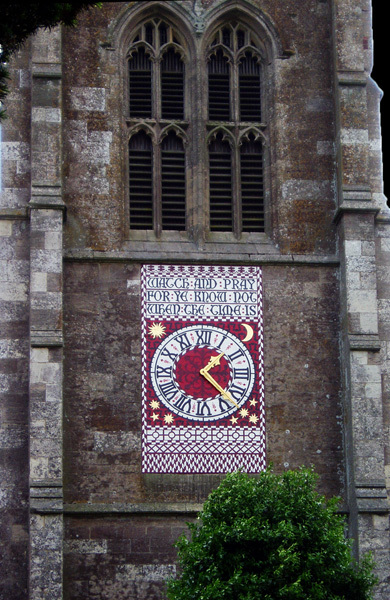 The church of today dates from the 11th century. 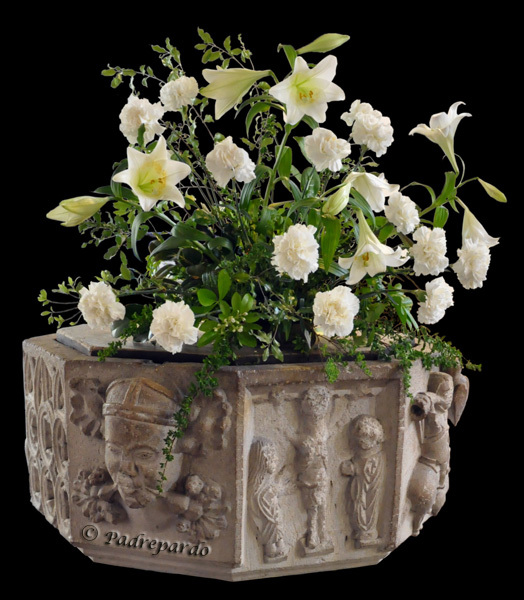 The sarcophagus of Sainte Abre was discovered in 1762. 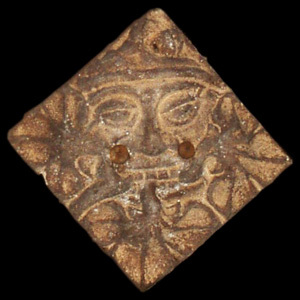 Decorated in a style of the end of the 4th century or early 5th century. 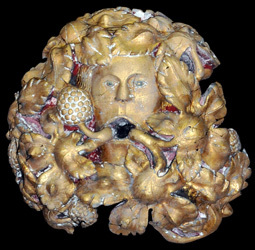 The head is clearly roman, judged by the leaves around the head. Also here new leaves sprout from the nostrils. 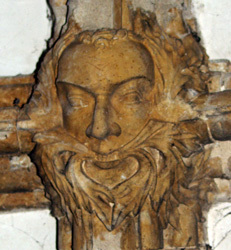 Is this the oldest surviving example of a Green Man in a church ? 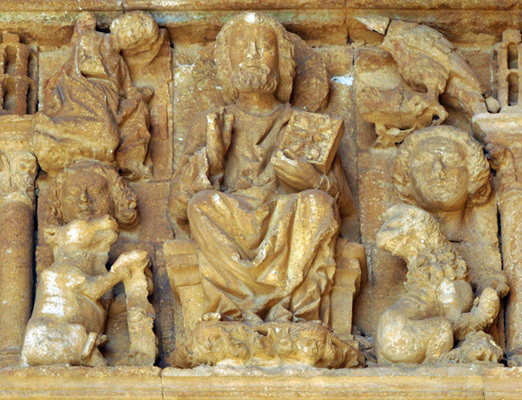 Left : Christ seated with a book in his hand with a head with leaves on the fore head and round the mouth. The leaves on the fore head refer to the written word, the four Gospels, the book. 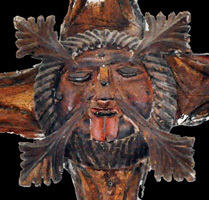 The leaves around the mouth refer to the spoken word. See E.L. Hoffman-Klerkx in magazine "Oud Utrecht" 67th year nr 2 March/April 1994. 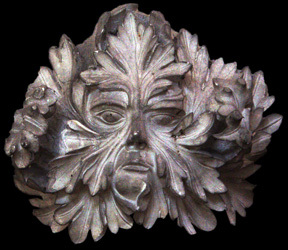 Also here the Green Man has a clear meaning and is absolutely not a fertility symbol as is often said. 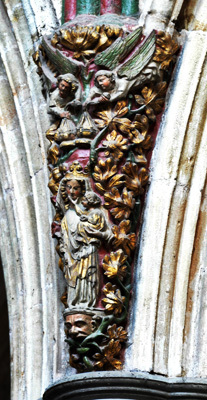 Left : Maria and Child on top of a Green Man. 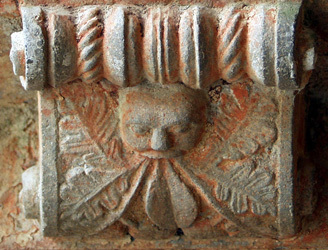 As in the Elkstone tympanum before and the book in Villalcázar de Sirga, the Green Man is literally and figuratively the bearer of the good news. So the Green Man did have a function in the church. 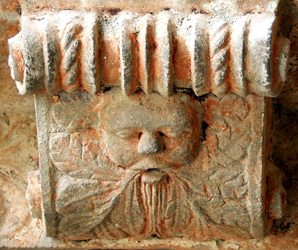 Green Man on 13th century font in Lostwithiel, Cornwall, England. Click here for more about this font. 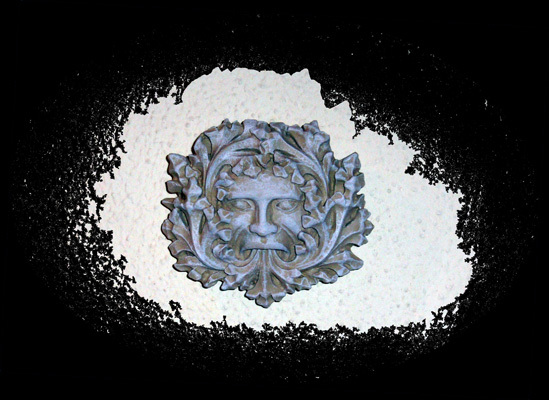 The roof boss on the left is formed by two Green Men. Click here for more about this glass. 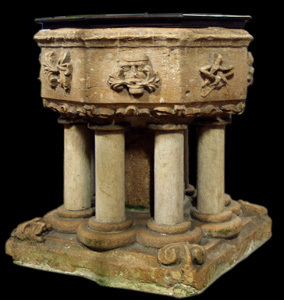 Font with a Green Man. 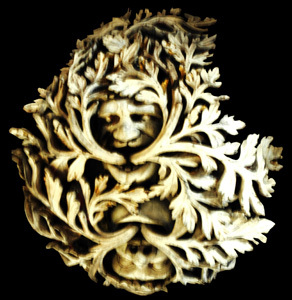 Enlargement of the Green Man. 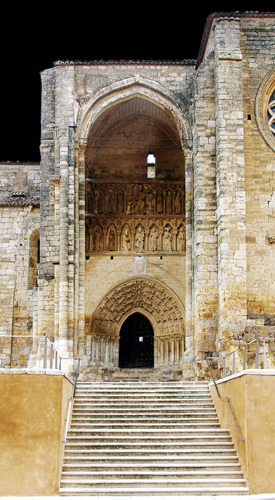 Santa Maria la Real de Nieva, Spain. Both Green Men above are from the same century. The one on the left seems to be much older. 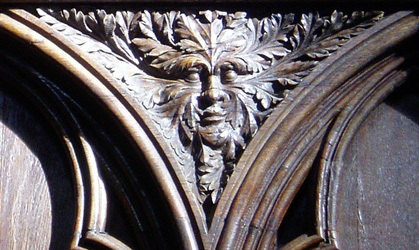 The cloister was built in the 15th century so a possibility is that the Green Man on the left has been re-used from materials of an older church which was destroyed. 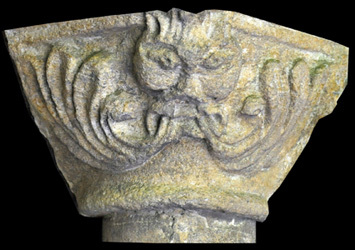 Many capitals in the cloister give the impression of being from the 12th or 13th century but they are really from the 15th century. On misericords very beautiful carvings can be found, carvings which, sometimes with great humor, depict scenes of daily life. 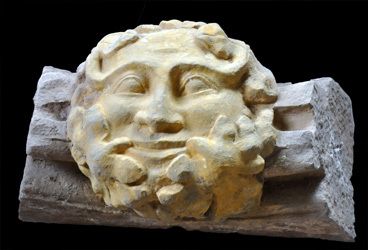 The Green Man can not be missed there as is shown here in Ludlow. 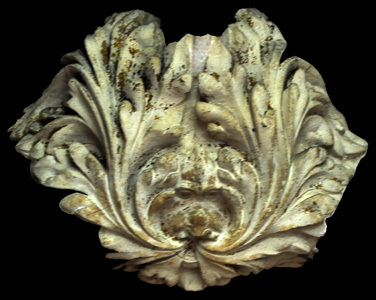 For other misericords click here . Some Green Men are really extraordinary and impressive. Just above the door in the lintel a very small head can be seen in the lower corner as well as at the left as at the right. 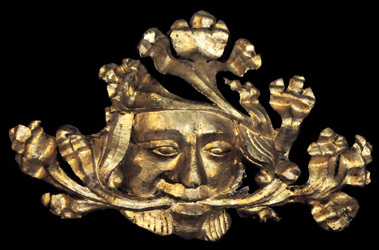 The branches with leaves come out from the mouth of one Green Man and disappears in the mouth of the other Green Man. Decoration clearly plays a role as well as symbolism, that is, all churchgoers leave the church by passing underneath. Also here you have to pass underneath the leaves, however, here is only one Green Man. He can be seen in the bottom left corner. The picture at the right is an enlargement of that corner. 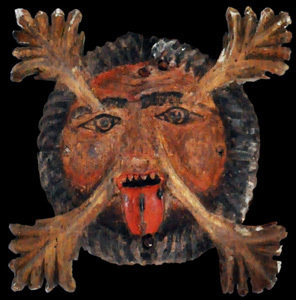 Just above the black rim, in the middle you can see the branches leaving the mouth and just above that is the nose of which the nostrils can be clearly seen and then the eyes. 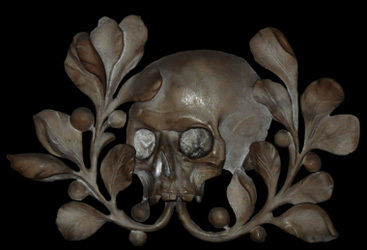 Also here decoration and symbolism go hand in hand. In case of difficulty in finding the head, move the mouse pointer over the image on the right. 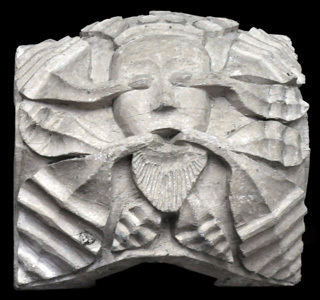 c) as protector for life, for example Elkstone, Stow (12th and 15th century). 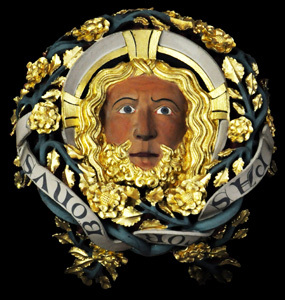 Apparently the original meaning of the Green Man in the church got lost and in later times the Green Man has mainly been used from tradition and decoration. 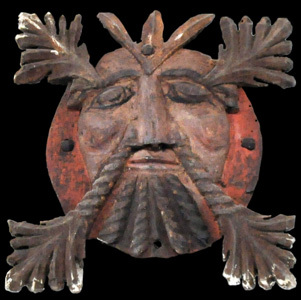 There is no evidence that the Green Man was a fertility symbol, this is often claimed but never proved. 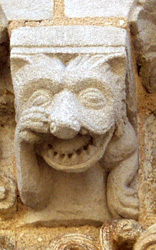 However, fertility symbols can be found on churches, for example Kilpeck, Southwell Minster, Ely Cathedral and Woodkirk in England (sheela-na-gig) and in Spain for example in Artaiz, Cervatos in Campoo de Enmedio, Castañeda, Fromista and Yermo and in France forexample in Vaux-sur-Aure. For more Green Men click here. From a guide book of the church. 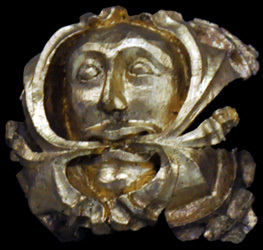 During the Civil War (1642 - 1646) Royalists were hiding in the church thus trying to escape the Parliamentarians who tried to smoke them out. The Royalists had stabled their horses in the church and used the font to christen a horse and named him Charles. During the reign of Henry VIII a many monasteries and churches have been destroyed across England. As a result the church St Mary Redcliffe has no surviving medieval windoes. 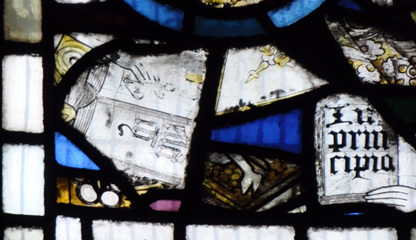 Fragments of glass from all around the church has been collected and brought together in 1893 into the North Window of which two parts are show above. 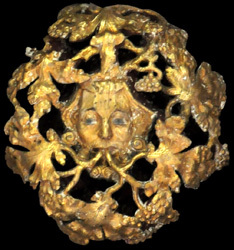 In the left part a Green Man is seen as well as another head. 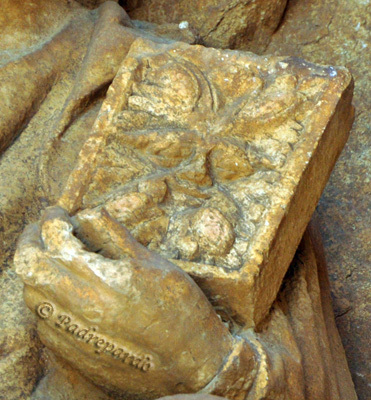 In the right part a page of a book is seen with the latin text "in principio" which means "in the beginning". 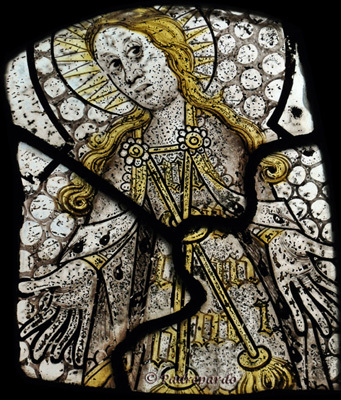 Also in other churches fragments of glass are brought together and sometimes beautiful figures are saved in this way. See example below. The mermaid as a seductress. A servant secretly taking wine. An owl, in those days a symbol of ignorance. Click here to go back to the page. In the first three centuries of christianity, in the roman empire around the Mediterranian the christian faith was forbidden, thus meetings took place in the greatest secrecy. As a sign of recognition was among others, used a fish. In the Greek language the word fish is IXƟYƩ and the letters of this word were the first letters of the words, translated, Jesus Christ God's Anointed Son. 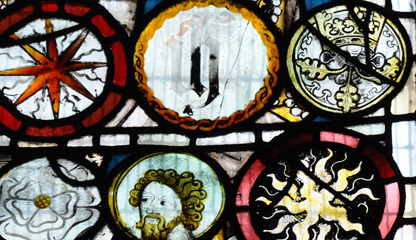 Of the same word a monogram can be made in the shape of a wheel with eight spokes. 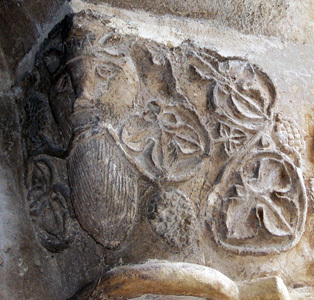 The shape of the Green Man, left, can be a reminder of the afore mentioned monogram. See the above row of pictures for how the monogram functions. It is possible that a similar situation existed in the area around King's Nympton. Fact is that Cornwall and Devon were the last counties in the west of England where christianity was introduced and that they were very, very hostile to the christian faith. 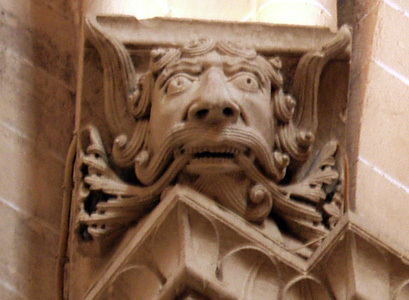 The Green Men of this church are older than the present church which is of the 14th century. 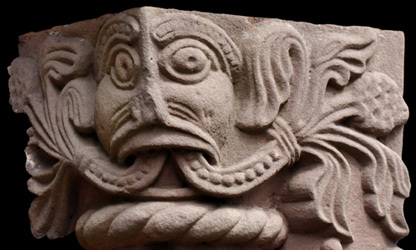 They come from an earlier church on the site. The church makes the impression of a transition church from the romanesque period to the gothic period, thus early 12th century. The arch on the foreground is extremely high. 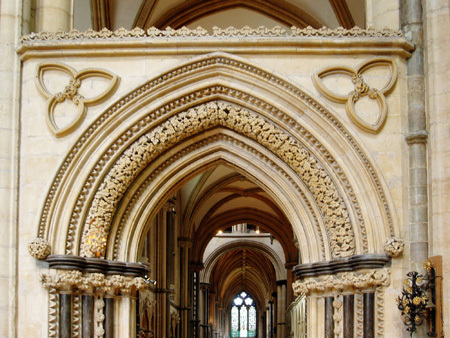 The arcade over the door consists of five arches and above that is a row of figures among which the Virgin with Child, and above that another row of figures among wich Christ seated with a book. Standing in front of the door and looking up, it hardly possible to see what is on the book. It is on that book that the Green Man can be seen. 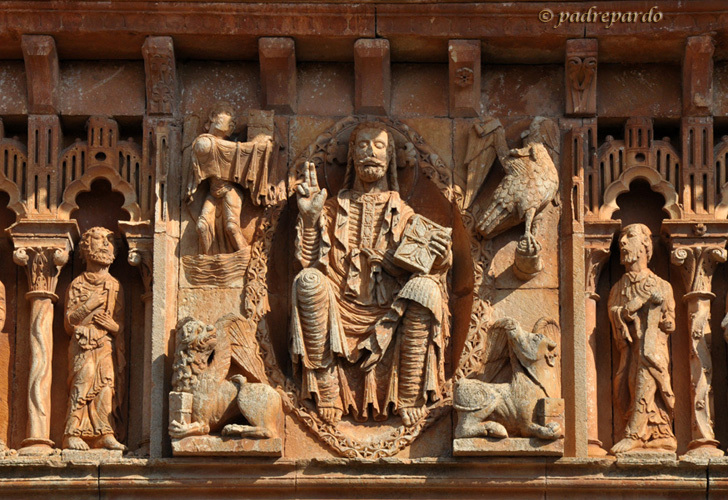 Local people and even the clergy do not know about the existance of the figure of Christ here and the book but they do know about all the four other figures of Christ with a book in neighbourly places which are from the 15th century and not situated so high which might be the reason that this Green Man is so unknown while it is so special. On the book of the other figures of Christ is no Green Man but a cross as in Moarves de Ojeda, see foto below.